Silver had very powerful break out today as investors are seeking assets that are safe and will retain value during a debt crisis. Silver is seeing demand at these price levels as it is historically cheap relative to gold. If the ratio came down to the levels it was in 2006 it would be close to $27 an ounce. Silver is soaring because investors are realizing this is a hard asset, it is money and it is historically cheap compared to gold. Gold has reached overbought conditions from my July 28th buy signal. Right now gold is a bit overbought while silver is at an interesting buy point, having found support for the fourth time at its long term 200 day moving average. Today’s breakout of the symmetrical triangle, a very bullish chart pattern, is a sign that silver has built up a lot of internal strength and could break out into new three year highs. Remember, silver is significantly below all time highs while gold has already broken into new highs. While I am bullish on gold, I believe investors could see a higher percentage move in silver. I have also alerted my readers to a specific mining company which has recently found a major discovery in Mexico. Pure silver discoveries are very rare. Silver supply is mostly produced as a byproduct which makes supply very inelastic. A new pure silver discovery in a silver bull market could receive a nice premium. I believe silver will make a major move on this break out. Investors are looking for a safe haven, protection and value in silver. Gold has already made a significant move and is quite overbought, while silver has not participated to the same extent. The gold silver ratio should move to historical norms which could mean a major move for silver. 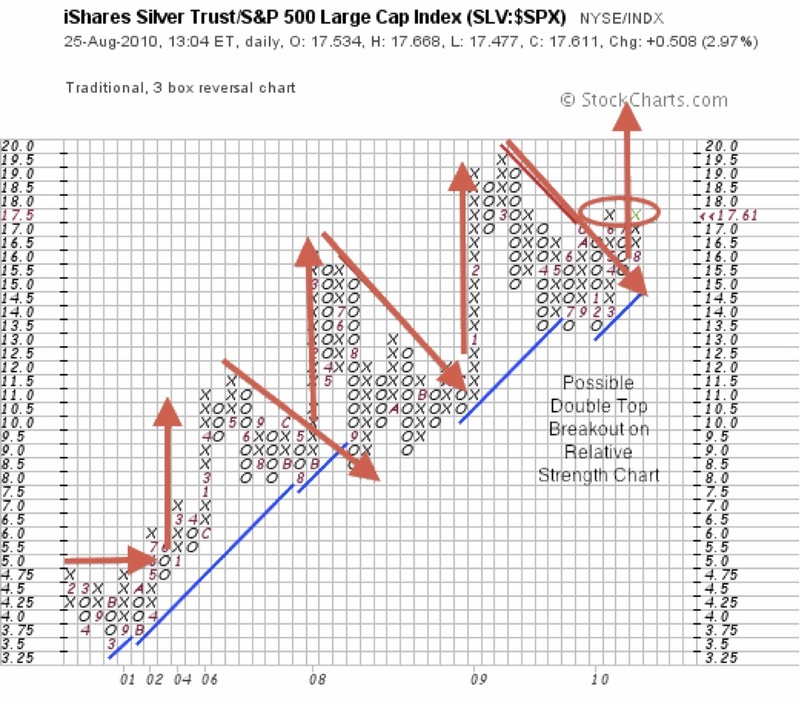 If you do a study of the point and figure chart of the relative strength of silver versus the S&P500 since 2001, its strong uptrend is apparent. 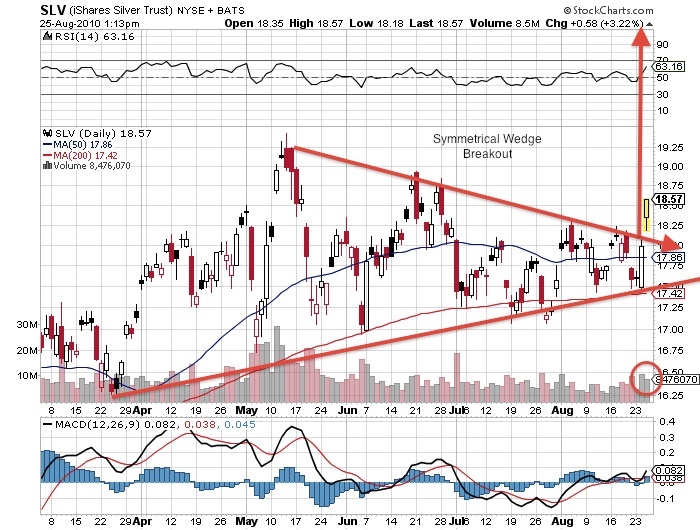 Each time silver falls back into support, it breaks out and makes significant rallies. The break above the red bearish resistance line and a double top breakout coupled with the daily chart symmetrical wedge pattern demonstrates that silver has reached a critical juncture and could make a nice move. Why is Silver Soaring and Outperforming Gold in 2012?